It may not seem like I consume my mother's wishful portion of greens per day if you glance through my Instagram gallery, but in reality I actually eat salads quite often. They mostly consist of dishes I've perfected to delight my own palette in my small kitchen in College Park, but I love going to neighborhood spots to try their seasonal and staple dishes. It's a great way to get ideas for recipes at home as well. Since it's National Salad Month (says the all-knowing and invisible food calendar powers that be) here are 7 spots you might want to check out specifically for what Ron Swanson calls "the food that your food eats". Many lunch trips to Whole Foods got me addicted to the Garlicky Kale they often have in their prepared foods section. So addicted in fact I tried to duplicate the dressing at home. When I first visited Market on South and saw they had an entire salad not only with Garlicky Kale, but married with blackened corn, pickled watermelon rind, red onions, and naan croutons I knew I had to have it. To this day it's one of the only things I repeatedly order when I visit this spot for food (and not doughnuts). 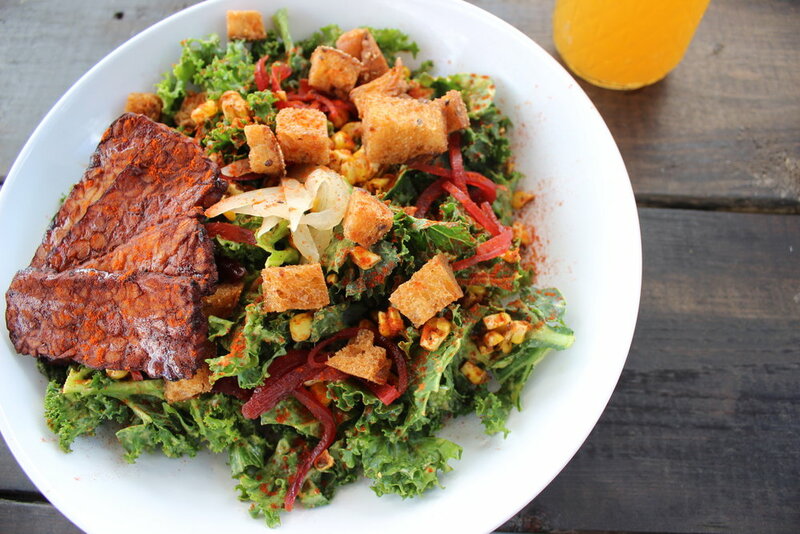 You can add tempeh bacon to the salad (seen below) but honestly it's pretty perfect as it comes. The Strand menu is so seasonal, that it's a little dangerous to post this amazing Florida Strawberry salad because it's probably not even on the menu anymore. Regardless, The Strand is always offering amazing salads with local ingredients that actually get me to say no to their tempting Strand Burger, and keep things lighter and my pants not busting at the button. This beauty came with Kale, English Cheddar, spiced walnuts, and a bacon-shallot vinaigrette. The Sanctum is a great spot for not only for healthy, filling salads, but for eating in comfort (preferably Yoga pants) with no one judging you. Sadly for all the times I've visited I've never been able to move past my favorite salad to try anything else. Normally I love to be adventurous and try a new item every visit, but I can't say no to their Kale Ceasar salad. A blend of kale & daily greens, roasted rosemary potatoes, slivered onion, & quinoa. All tossed in sea-vegetable caesar dressing & topped with toasted chickpeas. It will never get old and I hope they never take it off the menu. Out of all the salad joints in all the cities, Eden's Fresh is probably the one I've loved for the longest and visited with the most frequency. It's affordable, it's fast, and it's good, every single time I visit. My go-to salad is "The Dude" which consists of Romaine, Onions, Green Peppers, Tomatoes, Mozzarella, Tortilla Strips and Ranch Dressing. For protein I add the Blazing Buffalo Chicken to mine. It's not just about tea and Bricktoast here, (although I often stop by for that sweet combination). KrungThep has some delicious and unique salads called "Naked Sandwiches" that you aren't going to find other places around town. 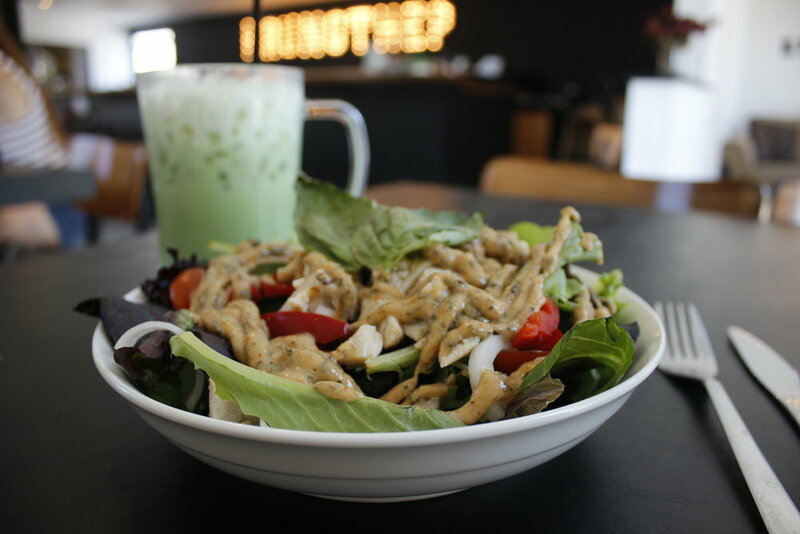 The Gra-Prow Chicken salad is almost too spicy for me, but the flavors are so good I just slurp down my Matcha iced latte between each bite so I don't start crying. I'm desperately trying to build up my tolerance to spice and this salad is the perfect way to train my taste buds. It consists of chicken, fresh basil, white onion, red pepper, tomato and creamy basil dressing make up this beauty. So good it hurts, but I'm not complaining. We all know the Ravenous Pig to be one of the best spots in town for a pleasurable carnivorous meal, but don't forget about their salads when you visit. They currently have two new options on the menu to check out. The Farmer Salad comes with bitter greens, house smoked bacon, brioche croutons, Parmesan, soft-boiled egg, Caesar vinaigrette. The Gatherer Salad mixes frog song lettuces, avocado, pickled beets, radish, goat cheese, pistachios, herb vinaigrette. 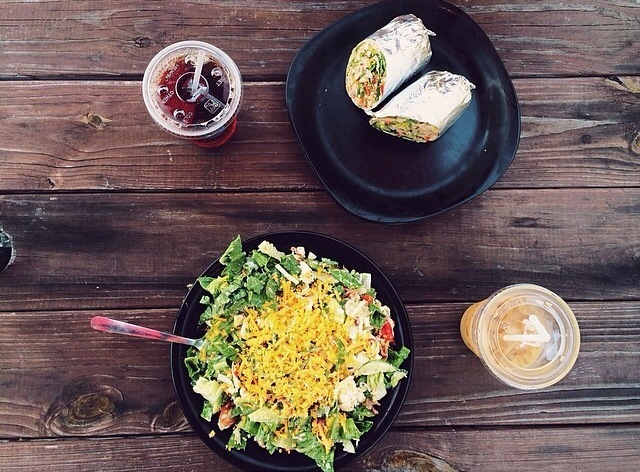 No matter where you go in town, we can't escape the glory of the Kale Salad. Over at Cask & Larder they have their own take. It features a variety of kale, peaches, avocado, beets, almond granola, and bacon vinaigrette. Their happy hour is a great place to split some menu items and indulge. Adding this salad to the mix might make you feel a little less guilty about those cocktails and $1 oysters. Hopefully some of these dishes will have you feeling a little leaner and satisfied next time you dine out.